Offer Details: Enjoy 15% off your wine purchase. Excludes St. Francis Port. Food Pairing: Known for the food pairings as much as for the wine produced. St. Francis is a “must see” when visiting Sonoma. Awards abound for the food pairings. There are hundreds of rave reviews to see online. Sit in a sunny, round table for 16 overlooking the gardens for the food pairing. It is not just a piece of cheese or a cracker. It is a creation that is perfectly complementing each wine you taste. Vineyards: There is a tour of the vineyards available. Or, you can do the self-guided tour. Learn abou the life-cycle of the vine. Discover the differences between the many grape varietals. Did you know each has a unique leafe shape? Sustainability processes are also described along the path. The vineyards are beautiful to view year-round. The colors swap depending up on the season. The fields are green in the winter, while the vines are dormant and brown. In the summer the vines are green, while the fields are brown. History: The founder of St. Francis Winery is Joe Martin. In 1971 he planted 22 acres of Chardonnay and 60 of Merlot. This was the first time Merlot appeared in Sonoma Valley. He partnered with Lloyd Canton in 1979 by opening St. Francis. The first winemaker was Tom Mackey, (1983). He expanded the wine program as they purchased more land. Today, Katie Madigan and Chris Louton are the winemaking team. The style of the wines are fruit-driven and all from Sonoma County grapes. Much of the vineyards are “Certified Sustainable” vineyards. Wines: St. Francis Winery has something for everyone. There are many white wines to choose from. Rose, two different Chardonnay, Sauvignon Blanc, and a white blend. Besides Merlot, you can find Cabernet Franc, Claret, red blends, Zinfandels and Cabernet Sauvignon. The wines are affordable and delicious. Cheers! Purchase your Priority Wine Pass now! 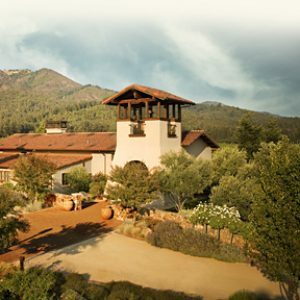 Discover the great hospitality of St. Francis Winery. Awesome wines. Karen was amazing and very knowledgeable. Keith was very friendly and personable. Defitnitely will visit again. Thanks for making our first Cali wine tastng experience one to remember. We’ll defintely be back .